Rab GTPases, members of the Ras super-family of GTPases, express at least 60 isoforms in humans1 with 24 enriched in, or specific for, the central nervous system (CNS)2. Rab GTPases are integral regulators of intracellular membrane trafficking, regulating the formation, maturation, transport, tethering, and fusion of vesicles in the endomembrane system3. In neurons, Rab-mediated membrane/vesicle trafficking is involved in virtually every aspect of neuron physiology, and dysfunction has been implicated in several neurodegenerative diseases2,4-7 (Fig. 1). Indeed, dysfunctional membrane trafficking is an early marker of neurodegeneration5. 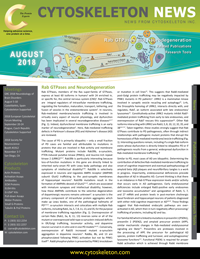 Here, Rab-mediated trafficking defects in Parkinson’s disease (PD) and Alzheimer’s disease (AD) are reviewed.